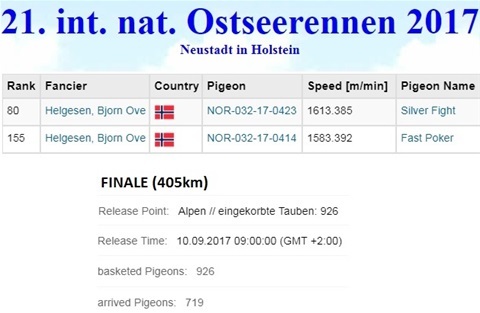 80 and 155 prize - OSTSEERENNEN FINALE (405km) !! In sunny weather and good visibility, wind force 2-3 SW from left, results in a very fast final race in the Ostseerennen. 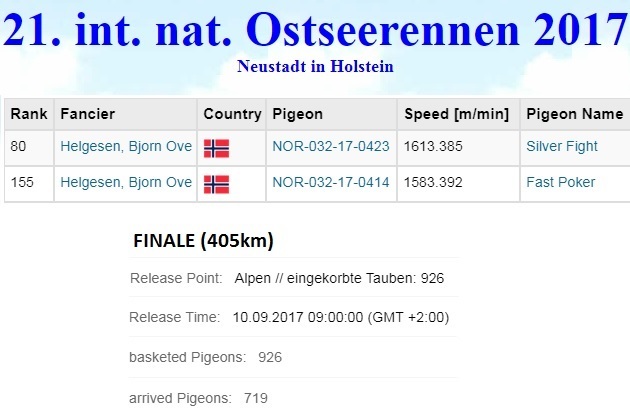 After about 4 hours at their wings, we are very happy with 2 out of 2 final birds prized as 80th and 155th. MOTHER of 80th prize “SILVER FIGHT” is a very nice grandchild “SKY FIGHTER” (a son of Pokerface from Andreas Drapa). MOTHER of “FAST POKER” is a direct daughter of the super breeding pair “TOTILA” x “HALLA” from Jens Borker.